Robert Conrad (pictured at right, circa 1965) starred in two of my favorite childhood shows - The Wild Wild West and Baa Baa Black Sheep. I didn't catch The Wild Wild West until it hit syndication, and even then only on occasional visits to my late grandparents' house (as they were the only ones who had cable TV for most of my childhood). My family used to watch Baa Baa Black Sheep together when it aired in the 1970's. Lately, because of my fond memories of both shows, I've been binge watching them in the evenings after work. 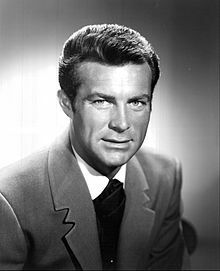 I had always liked Robert Conrad. His performances stuck with me when those of many other fine actors and actresses that I have watched over the years didn't. Now that I'm older, I can see why Conrad's work has stuck in my mind. In The Wild Wild West, Conrad plays James West. West is part secret-agent, part cowboy, and part barroom brawler. Conrad manages to pull off all three elements of the performance. West comes across to the audience as confident, competent, intelligent, and likable. At times, when the crazy contraptions and sometimes cheesy sets start to pull you out of the reality the show is trying to create, Conrad's (and fellow star Ross Martin's) performance brings you back in. Yes, the show at times was campy, over-the-top, and a little silly. But Conrad and Martin played their roles so well you don't care. It's fun to watch them work. What's really amazing to me is how much of his own stunt work Conrad did back then. When you see James West hop off a high railing, grab a chandelier, swing across the room, and land on the bad guys, very often you're seeing Robert Conrad doing that - not some unknown stuntman. You know that because you see his face. These were not simple stunts in most cases. They were very physical acts that required skill and strength. Conrad isn't a tall man, though he's no shrimp, either. I've read that he is 5'8" tall. Often, in The Wild Wild West, we see James West go up against actors who are considerably taller than Conrad. In the hands of someone without Conrad's skills, fight scenes against larger opponents could look ridiculous. While not every fight scene came off perfectly in that regard, I usually find myself believing that James West really is taking down a bigger (probably stronger) opponent. That's a testament to Conrad's acting and stunt abilities. In Baa Baa Black Sheep, Robert Conrad plays an officer in charge of a squadron of pilots who were all destined for a court martial. His character, "Pappy" Boyington, disregarded and antagonized the military leadership, flagrantly broke the rules, got into fights, got drunk, and womanized. It would be very easy to watch stories about a person like that and grow to dislike them. The writers of the show, and Conrad's acting, make Boyington an enjoyable character to watch. We have no trouble believing that Conrad's character loves flying, loves his country, cares for the men under his command, and enjoys a good time. When I finish with these two series, I will start seeking out his other work to enjoy. I have no doubt that he delivered the same caliber of performances there. Thank you, Mr. Conrad, for the many hours of entertainment you've brought me over the years. I have been impressed with your work and skill for most of my life, and continue to appreciate what you've accomplished. I wish you nothing but the best, and a long (even longer) life. To me, you're one of the finest actors and stuntmen ever to appear on screen. I've waited too long to express my appreciation for a number of people. Adam West and Carrie Fisher as two examples. We lost them before I got around to letting them know I respected and appreciated them. I don't want that to happen again, so today I'd like to talk about the amazing and talented Matt Frewer. 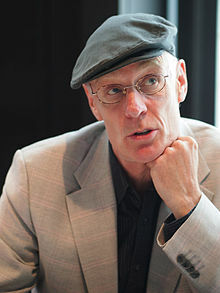 Matt Frewer is an American-Canadian actor whose work I've very much appreciated. Whether it was a bit part he played in Monty Python's short film The Crimson Permanent Assurance back in 1983, his voice-over work in a number of movies, or Max Headroom (the role he's perhaps best known for), I've always enjoyed seeing him work. His work always seems dead-on and effortless. Probably the best testament to Frewer's abilities is the fact that he's been a part of many popular films and television shows over the last 30 years. You'll find him (or his distinctive voice) in The Fourth Protocol, the sitcom "Doctor, Doctor" (which I really loved), Star Trek: The Next Generation (as a time-traveling con-man), Batman: The Animated Series, Disney's Hercules movie, and more recently the BBC sci-fi series Orphan Black. He even played Sherlock Holmes at one point. I've never been fortunate enough to meet Mr. Frewer in person. I hope that someday I do. I could be very wrong, but I think we would get along well. He seems like a very intelligent, down-to-earth guy with a great sense of humor and a touch of humility. Even at the height of his popularity as Max Headroom (one of the icons of the 1980's for those too young to have been there), he never seemed to be taking himself, his popularity, or the role too seriously. Thank you, Matt, for all of the great work you've done. I still enjoy watching and re-watching the work you've done, and suspect I always will. I will often watch movies and television shows that aren't "my thing" just because I see your name in the credits. I wish you a very long life, continued success in your career, lots of happiness, and nothing but the best. I look forward to seeing you in your next role. I suppose it's a sign of getting older that so many people I've come to regard as fixtures in my life are gone. I lost my grandfather in 2004, my mother in 2008, and my remaining grandmother just a few weeks ago. Adam West has been one of those fixtures. When I was very young, I watched him regularly as Batman. For many years, this was the only portrayal of The Caped Crusader that I knew. While other actors have played the character since then and done a fine job of it, it's still Adam West's Batman that I think of first and foremost. West's deadly serious portrayal of Batman is a pleasure to watch. West's Batman always had the exact, perfect gadget for any situation. Everything in his Batcave was labeled, despite the fact that he and Robin clearly knew what everything was. No matter how ridiculous the situation his character was placed in, no matter how campy or minimalist the set, no matter the eye-rolling cringe-worthiness the line he was given to say ("Confound it, the BATteries are dead! "), West delivered us a Batman who took his crime-fighting seriously... and never neglected his duties as a public citizen (even putting money in the meter when he parked the Batmobile). I still enjoy watching the show today, even though I probably know most of the episodes by heart. As campy and silly as the show was, the always-by-the-book Batman West portrayed had an effect on my young mind. It taught me that no one, whether a rich millionaire, deputized crime fighter, or well-loved superhero is above the law or beyond the rules. West's Batman would never have so much as parked illegally in his fight against crime. We don't see heroes on television like that anymore. Today's television heroes are rarely so upstanding. I got to meet Mr. West briefly in the 1990's. I was living in Pittsburgh at the time. He was making an appearance at a convention to celebrate the Night of the Living Dead movies, at a facility near the shopping mall used in the original Dawn of the Dead film. I stood in a line to get his autograph. He misplaced his marker after signing for the person in front of me, so I got to stand and chat with him while someone got him a new one. West was very kind and cordial to me, though he was understandably distracted when a lovely young woman in a white skin-tight dress showing a lot of skin and curves appeared to my left. A good actor can become inextricably identified with a role they play on television or in the movies. So it was with Adam West. His portrayal of Batman got in the way of him getting other acting jobs for quite some time. Thankfully, there were shows like Family Guy and The Fairly Oddparents that were willing to give him a chance. While his legacy as Batman deserves a place in entertainment history, I'm glad that he won't be known exclusively for that. Earlier this year, an animated Batman movie was released that featured Adam West, Burt Ward, and Julie Newmar reprising their roles from the 60's. I rushed to buy it as soon as I found out it was available. It was great to see (or at least hear) West performing the role that made him famous. It was also a little sad, too, in that you could tell by the sound of his voice that West wasn't a young man anymore. That meant we might lose him at any time. Sadly, that time has come and gone. Thank you, Mr. West, for taking on the role of Batman and bringing so many hours of joy into my childhood. Thank you for being nice to me at that convention all those years ago. You always have been the first and best Batman to me. I will miss you now that you're no longer with us, but will take comfort in knowing a part of you will always live on in Batman reruns. Note: I actually started this post back in September, but somehow never got around to finishing it. In hindsight, I wish I had. Carrie might have seen it if I had. Like most people reading this, I first became aware of Carrie Fisher when she appeared as Princess Leia in the Star Wars films. I got a kick out of seeing her in The Blues Brothers, then in Postcards from the Edge (which she wrote), her one-woman show Wishful Drinking, the newer Star Wars movies, and the occasional interview or talk show appearance. She was always witting, charming, intelligent, and beautiful. The Wishful Drinking show is where I really gained my greatest appreciation for Carrie. In it, she talks about the down-side to growing up the child of Hollywood royalty, relationship issues, substance abuse problems, mental health struggles, and dealing with the unflattering remarks from Star Wars fans who expected her to be as gorgeous and thin at age 60 as she did during Star Wars at age 19. Dealing with all that would probably drive most of us toward substance abuse and mental health problems. Carrie shared all this, not in a "woe is me" style but very matter-of-factly with insight and humor. It was really an impressive show. As a writer, the thing that impresses me the most about Carrie is that she was regularly consulted to help improve movie scripts. She started doing this during the original Star Wars movies for George Lucas, and later for many other big names in Hollywood. Often she did the "script doctor" work without on-screen credit. It wouldn't surprise me if there are a number of films still in the pipeline with her "fingerprints" on them. I suppose she will live on for a while through that. After her appearance in the recent Star Wars sequel and the release of her book The Princess Diarist, I felt really happy for Carrie. She was finally getting the recognition she deserved for her talent. I had hoped this would revitalize her career and looked forward to so much more from her in the future. Sadly, that will not be the case. I had long wanted to meet Carrie, to thank her for all her hard work, to let her know I understood her struggle with bipolar disorder, and to tell her that even at age 60 she was still a beautiful woman. I also wanted to congratulate her for finding her way through all the trials and tribulations in her life, and coming out the other side smiling and laughing (rather than bitter and cynical). How she dealt with her problems is an excellent example for all of us. I will miss you, Carrie. Thank you for your written and on-screen work. Thank you for being brave enough to shine a light on your troubles, and show the rest of us how to do it. You deserved every bit of success you had, and much more. Continuing on with the Happiness Experiment, in which I express sincere gratitude to someone each day (either here on the blog or in person), to see if Shawn Achor's referenced research decreases my pain levels and increases my happiness. This week, pain levels on a "moving average" basis since the start of the experiment have gone from 5.1 to 5.4. On a regular average basis for this week alone, they've been 6.28. Compare this with my vacation week (the previous week), which was a 4.7. Happiness scores as measured by the Oxford Happiness Questionnaire have been a consistent 2.21 this week, which the test notes refer to as "somewhat unhappy." My moving average over the last three weeks has been a consistent 2.3. I think it's safe to say that expressions of gratitude aren't doing anything for my happiness level, which has been pretty flat since the start of this. My pain levels showed an early decrease, but have gone back up to a higher level than the start. I attribute this to a number of stresses I won't go into here, primarily at the office. It does seem that there is a very strong correlation between pain levels and stress, which gratitude journaling apparently has no impact on. For Week 2 of the experiment (January 10-16), I was on vacation in Curacao. I continued the experiment there, with in-person expressions of gratitude to the staff at the resort where we stayed, when they did something unexpectedly kind or helpful. The server who brought my dessert on my birthday asked the trumpet player to play for me and had the chef write "Happy Birthday" in Magic Shell chocolate on the plate... as one example. I tipped her, of course, but also thanked her and let her know I appreciated her efforts and those of the others. My pain level during the middle of that week dropped to a 3 out of 10, the lowest recorded level during the experiment to date. This tells me that stress and being cooped up in the office seem to contribute to pain levels. My pain levels during and after the return trip have been consistently high. My happiness level, unfortunately, wasn't measured during the vacation. I can tell you that I was very relaxed and comfortable there. I suspect if I had taken the Oxford Happiness Questionnaire during the trip, it might have registered a little higher than normal. The average level since the start of the experiment is 2.3 out of a possible 6, which is labeled "somewhat unhappy" by the test creators. As I write this on January 21, the last few days' pain levels have been trending up. The latest Happiness Questionnaire number is 2.21, lower than the to-date average of 2.3. The expressions of gratitude don't seem to be doing anything for my happiness, though there is a possible correlation to pain levels. Pain levels also appear to correlate to stress. We'll see if this continues in the days and weeks to come. From the title of this post, you'd be forgiven for thinking it's about the famous Hawaiian-born singer known for the song "Tiny Bubbles". Although I've nothing against the late singer, this isn't about that Don Ho. The Don Ho I'm thanking here is the software engineer who created the free (as in "free beer") source code editor and Notepad replacement for Windows called Notepad++. That's its logo over there to the left. In my full-time job, I'm constantly editing things. One minute it's a DOS batch file. The next it's a VBScript script, or an INI file, or Visual Basic source code, or a text file. Notepad++ handles all that like a champ. For files that contain code, it highlights the syntax and possible errors. It has a solid find and replace feature. It can "auto-complete" what I'm typing (though sometimes it gets confused and auto-completes errors into my code). It allows me to open several documents at once and tab between them. It launches fast and works well. I discovered Notepad++, oddly enough, actually doing my job. One of my responsibilities is to keep an eye out for malware that gets past our antivirus system. A tool I wrote compares the running programs on our fleet of about 2,000 PCs and compares the SHA hash (a kind of digital fingerprint) for the file against a database of known safe (or at least believed safe) programs and known malware (like the stuff used in the Sony hack). It generates a report that I look over each day to see if anything in there warrants investigation. For a while, I was catching about 20% of all the malware we saw at work with that tool. After my team and others made some security improvements, the malware being missed by antivirus software has nearly vanished. One of the early reports from the tool showed many of our staff using Notepad++ on their PCs. After verifying that these were actual copies of the real Notepad++ software, I worked to get everyone using the software on a company-installed and maintained (i.e., kept current) version. In the process, I tested the software myself and found it very handy. The source code editor I had been using, which cost the company quite a bit of money, was much more clunky as a casual editor. (However, it has many other functions for debugging, testing, and compiling scripts that prevent Notepad++ from being a full replacement.) I began using it a lot myself. I'm very impressed with the development of Notepad++. I've found it to be a solid, stable performer. It has not yet crashed in all the time I've used it, despite giving it some pretty crazy code to work on. It amazes me that there are frequent updates (every couple of weeks, it seems) which address bugs and extend the feature set. That costly product I mentioned earlier doesn't update often, and as an editor fails me every so often, screwing up the on-screen layout, changing how I've arranged various tabs, etc. Notepad++ is a workhorse editor and does its job well. So, a big thank you to Don Ho and the other Notepad++ contributors for essentially giving away your hard work for free. Thank you for the obvious care you put into the quality of the product, and for the frequent updates that keep it humming along nicely. I appreciate what you've accomplished and wish you the best. You've saved me a lot of time and effort on the job, which has helped me spend more time away from the job (i.e., reduced the need for extra hours of effort to get the job done). I appreciate what you've done and hope you'll continue doing it for years to come. I think I was too young to appreciate the last three, which chronicled an event Norwood called The Double-Spiral War. I found it an interesting series, but it wasn't a favorite. The other four books, which made up The Windhover Tapes series, still rank among my favorite books. There are many reasons why. Foremost among these is the complexity of the tale, and how well that complexity hangs together. The main character, Gerard Hopkins Manley (a take on the name of the poet Gerard Manley Hopkins) is a "contract diplomat" working for the "Fed" (or "Federation" - but not the one from Star Trek). Manley has visions of a past that has been wiped from his mind by the Fed for reasons unknown. Those memories show him married to an alien princess, sometimes at odds with a military leader and sometimes friends with him. In his travels, he encounters a professor who's researching a mythical literary character called The Tenderfoot, which seems to exist on almost every inhabited world. He encounters a planet populated by ghosts, gets caught in battles, and even falls in love and gets married. One very interesting part of the books to me is that they're told through a series of journal entries, sometimes written by Manley and sometimes by "Windy" (his ship, the Windhover). Conveying a complicated story like this in the form of a diary couldn't have been a simple feat. The first three books in the series tell the complex story line. The fourth book tells what happened to Manley during the years he can't remember, and may be even better than the other books. Over the years, I've owned many copies of The Windhover Tapes. Invariably, if I loan them to someone they never return. I don't know if that's because the recipients don't get around to reading them (and thus don't return them) or because they love the books like I did and want to hold on to them. Sadly, they are not available in electronic form. It's time I got around to the "gratitude" part of all this. I'm grateful that Norwood put the time and effort into crafting The Windhover Tapes, and that he kept writing, as it will give me more of his work to read. I would have loved to see him bring out more books in the series, but his passing in 2005 ensures that we'll never see another. Thank you for your hard work, and your books, Mr. Norwood. I'm sorry I was never able to convey that to you when you were still with us. 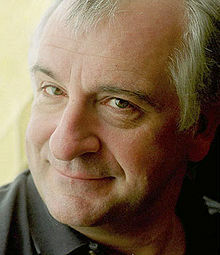 The late Douglas Adams is probably best known for his radio plays and books entitled The Hitchhiker's Guide to the Galaxy. In 2015, I took some time to study the late author's life, his influences, and of course his work. Doing this was useful and enjoyable. I learned that he and I were both influenced by the comedy of Monty Python. As I learned more about Adams, I learned of his appreciation for P.G. Wodehouse and Robert Sheckley. Having no familiarity with their work, I sought out several of their books and read them. It was interesting to see their influence in Adams' work. No, I'm not saying that he "stole" anything from them. He didn't. But it's easy to see echoes of their work in Adams' own. This helped me better appreciate something I learned from Austin Kleon in his book Steal Like an Artist. Namely, that every artist borrows ideas and techniques from those who came before, and builds on them. Adams clearly learned from these two (and probably Python), but created something I think is better than they did. Something else I learned about Adams was how much we had in common. We both had technology in common, and (around the same time on the calendar) were fans of the Apple Macintosh. (I later lost that fandom, but Adams retained it.) We both enjoyed Monty Python. Some of our musical taste was also very similar. I suspect that if we had met in person before he died, we might have been friends. Sadly, I'll never know. I know that many times during Adams' career, he wondered if he could really do it, if he could ever really succeed as a writer. He questioned himself and his abilities constantly, which I suspect almost every writer does. I am grateful that he stuck with it and produced The Hitchhiker's Guide to the Galaxy, Last Chance to See, Dirk Gently's Holistic Detective Agency, and his other works. These have taught me a lot about writing humorous stories. I thankful that he didn't give in to the self-doubt and get a job as a banker, a stockbroker, or something else. Thank you, Douglas, for hanging in there and cranking out the work you did. I only wish you'd been with us longer and been able to bring us much more. You deserved a longer life and a chance to enjoy all your success. On December 28, I posted the first installment in this series. Based on a talk by Shawn Achor, in which it is claimed that expressing gratitude daily for six weeks will increase a person's happiness and reduce their pain levels significantly, I've begun a habit of finding one person each day to whom I'm grateful in some way and sharing that gratitude with them. When I have contact with the person, I do so directly. When it's someone famous (whom I can't visit or call directly) or someone who's no longer with us, I express it here in the blog. I'm measuring pain levels with the standard physician-style 0-10 level, with 0 being no pain and 10 being the highest level of pain I've experienced. Happiness is tracked using the Oxford Happiness Questionnaire. Anecdotally, I'd say it's too soon to draw any conclusions. The daily pain numbers were showing a decline until today when they spiked back up. The happiness score increased on Deecember 29, but has been dropping since then. Today's score was 2.17, down from 2.34 at the start. Today's expression of gratitude wasn't recorded in the blog, but was a text message and verbal sharing with my brother-in-law from Pittsburgh. The experiment now continues into week 2.